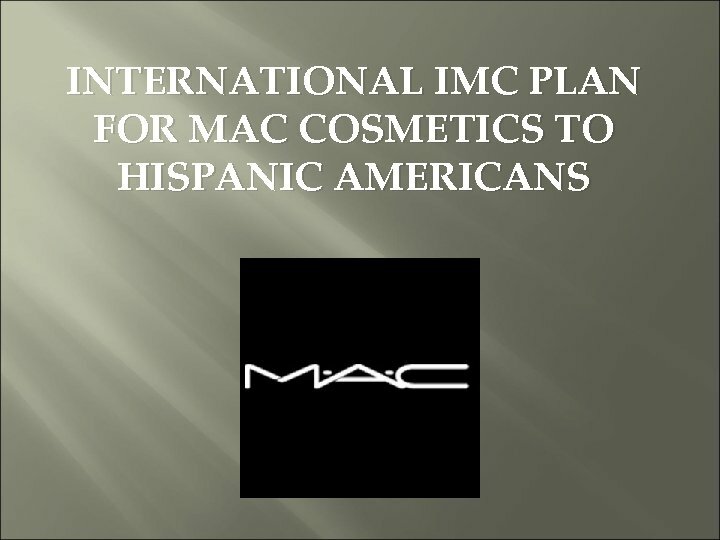 Competition Though one of the most recognized and popular cosmetic companies worldwide, MAC cosmetics still falls short in the mind of Hispanic consumers as number one. 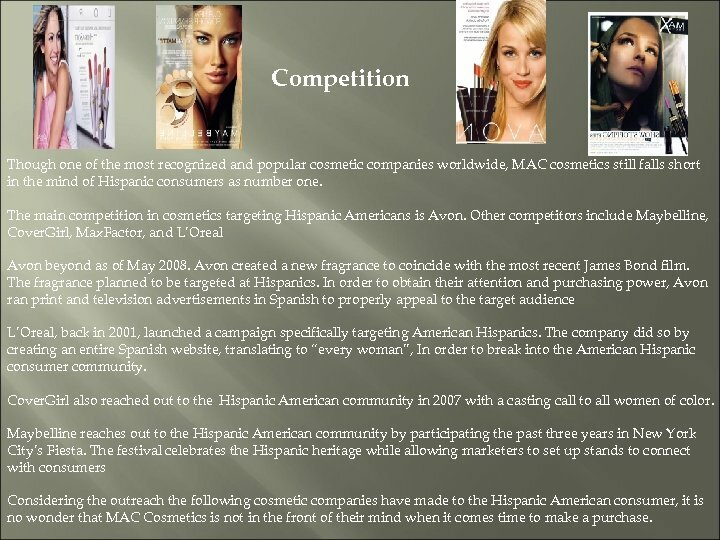 The main competition in cosmetics targeting Hispanic Americans is Avon. Other competitors include Maybelline, Cover. Girl, Max. Factor, and L’Oreal Avon beyond as of May 2008. Avon created a new fragrance to coincide with the most recent James Bond film. The fragrance planned to be targeted at Hispanics. 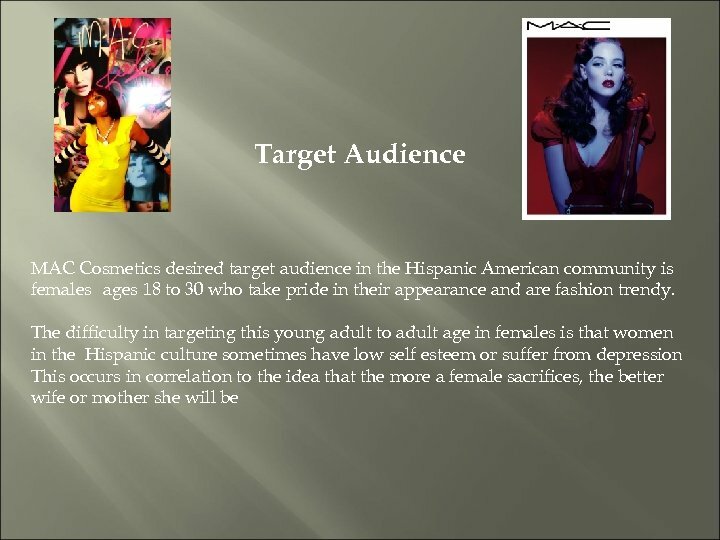 In order to obtain their attention and purchasing power, Avon ran print and television advertisements in Spanish to properly appeal to the target audience L’Oreal, back in 2001, launched a campaign specifically targeting American Hispanics. The company did so by creating an entire Spanish website, translating to “every woman”, In order to break into the American Hispanic consumer community. Cover. Girl also reached out to the Hispanic American community in 2007 with a casting call to all women of color. Maybelline reaches out to the Hispanic American community by participating the past three years in New York City’s Fiesta. 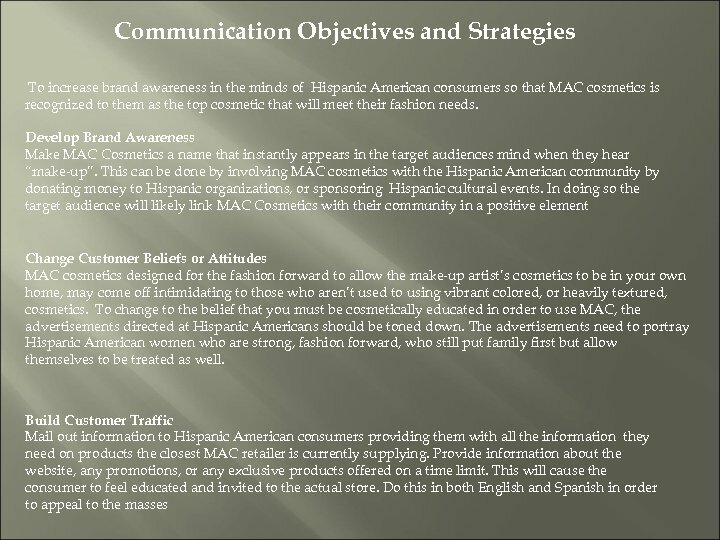 The festival celebrates the Hispanic heritage while allowing marketers to set up stands to connect with consumers Considering the outreach the following cosmetic companies have made to the Hispanic American consumer, it is no wonder that MAC Cosmetics is not in the front of their mind when it comes time to make a purchase. 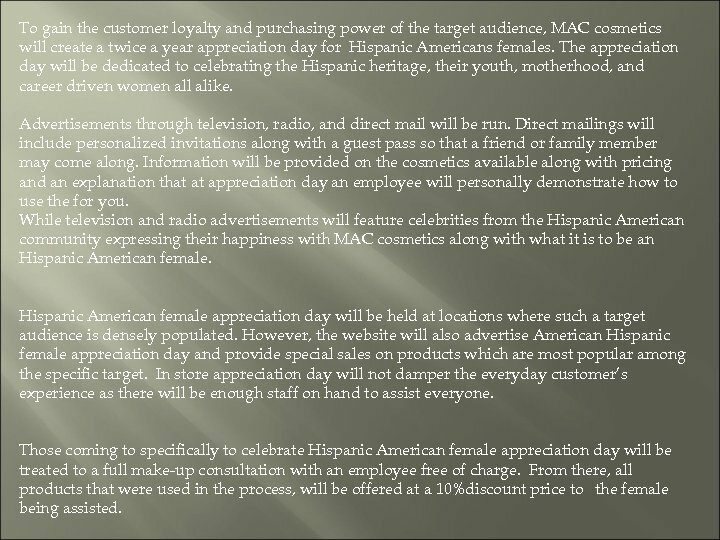 To gain the customer loyalty and purchasing power of the target audience, MAC cosmetics will create a twice a year appreciation day for Hispanic Americans females. The appreciation day will be dedicated to celebrating the Hispanic heritage, their youth, motherhood, and career driven women all alike. Advertisements through television, radio, and direct mail will be run. Direct mailings will include personalized invitations along with a guest pass so that a friend or family member may come along. Information will be provided on the cosmetics available along with pricing and an explanation that at appreciation day an employee will personally demonstrate how to use the for you. 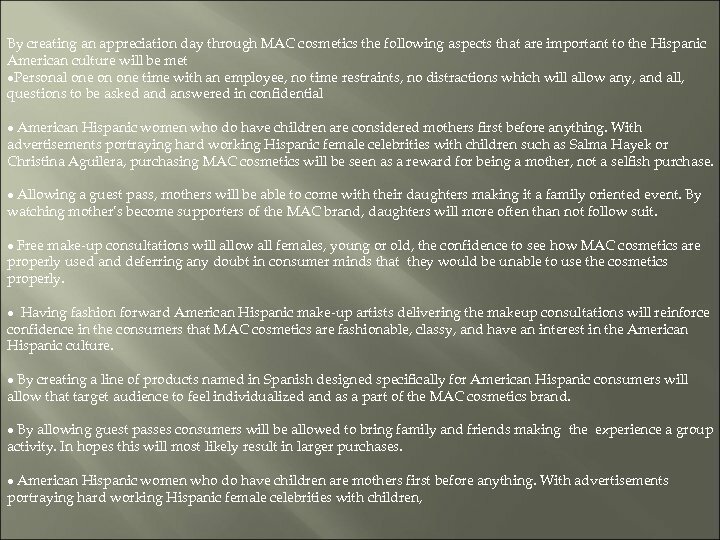 While television and radio advertisements will feature celebrities from the Hispanic American community expressing their happiness with MAC cosmetics along with what it is to be an Hispanic American female appreciation day will be held at locations where such a target audience is densely populated. However, the website will also advertise American Hispanic female appreciation day and provide special sales on products which are most popular among the specific target. In store appreciation day will not damper the everyday customer’s experience as there will be enough staff on hand to assist everyone. 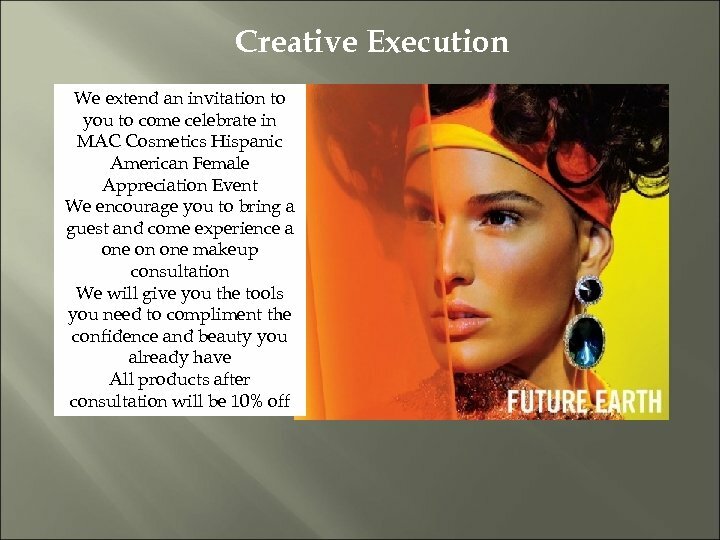 Those coming to specifically to celebrate Hispanic American female appreciation day will be treated to a full make-up consultation with an employee free of charge. From there, all products that were used in the process, will be offered at a 10%discount price to the female being assisted. 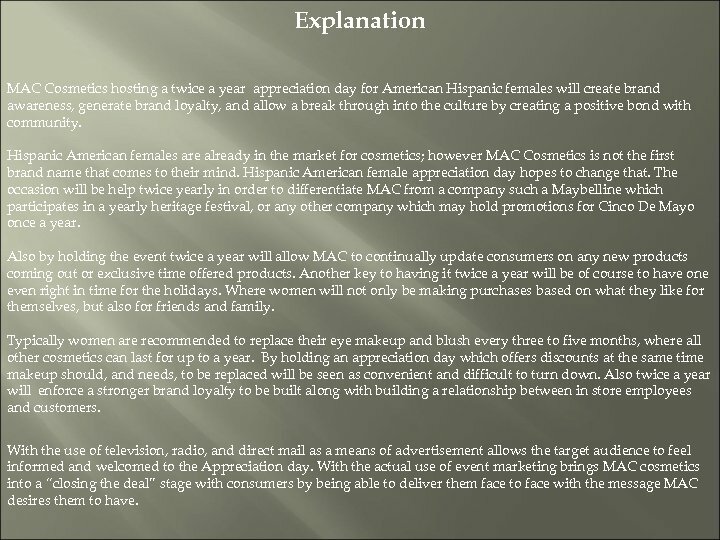 Explanation MAC Cosmetics hosting a twice a year appreciation day for American Hispanic females will create brand awareness, generate brand loyalty, and allow a break through into the culture by creating a positive bond with community. 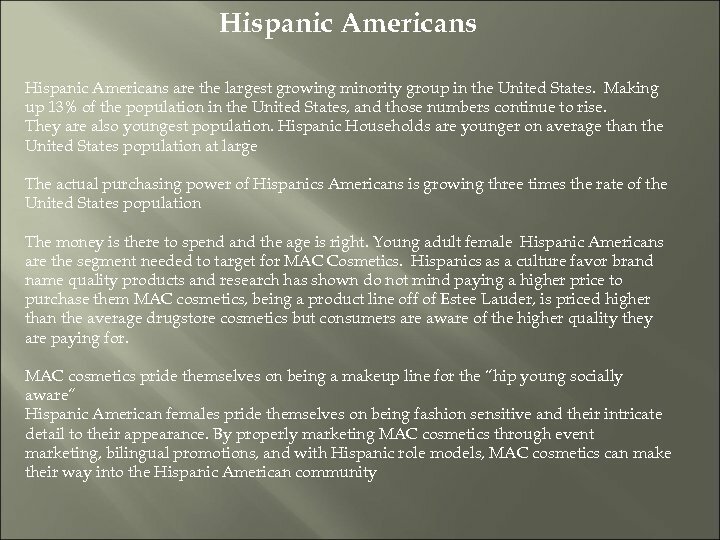 Hispanic American females are already in the market for cosmetics; however MAC Cosmetics is not the first brand name that comes to their mind. Hispanic American female appreciation day hopes to change that. The occasion will be help twice yearly in order to differentiate MAC from a company such a Maybelline which participates in a yearly heritage festival, or any other company which may hold promotions for Cinco De Mayo once a year. Also by holding the event twice a year will allow MAC to continually update consumers on any new products coming out or exclusive time offered products. Another key to having it twice a year will be of course to have one even right in time for the holidays. Where women will not only be making purchases based on what they like for themselves, but also for friends and family. Typically women are recommended to replace their eye makeup and blush every three to five months, where all other cosmetics can last for up to a year. 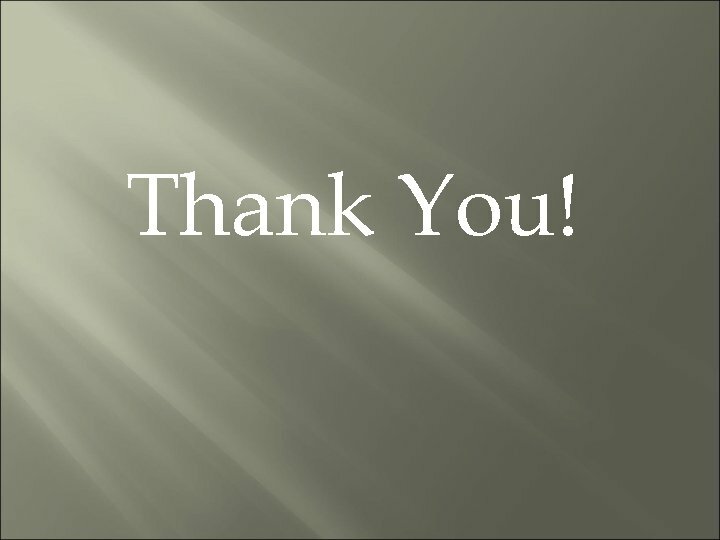 By holding an appreciation day which offers discounts at the same time makeup should, and needs, to be replaced will be seen as convenient and difficult to turn down. Also twice a year will enforce a stronger brand loyalty to be built along with building a relationship between in store employees and customers. With the use of television, radio, and direct mail as a means of advertisement allows the target audience to feel informed and welcomed to the Appreciation day. With the actual use of event marketing brings MAC cosmetics into a “closing the deal” stage with consumers by being able to deliver them face to face with the message MAC desires them to have.